You are here: Home \ Lab Happenings \ Our first qualitative publication! Last year we began a collaboration with the Family Communication and Relationships lab and began gathering stories from people affected by hearing loss to explore how hearing loss influences family members’ wellbeing, self-esteem, and overall self-concept. 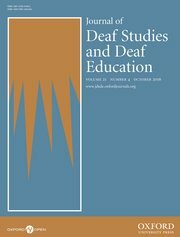 Today we found out that our qualitative study using interpretive narrative was accepted for publication with the Journal of Deaf Studies & Deaf Education. Keep your eyes open for “Exploring the identities of hearing parents who chose cochlear implantation for their children with hearing loss”.